The Helms-Burton Act is a central part of the embargo on Cuba: it officially writes the reactionary policy into law, prohibiting any president from unilaterally lifting it. Specifically, Title III allows U.S. nationals who owned property in Cuba that was seized by the Cuban government after the 1959 Revolution to sue U.S. and foreign companies for profiting from their former properties. What’s so egregious is that many of these are people who were Cuban citizens at the time. The infamous Title III has been waived every six months by every U.S. president since Helms-Burton came into effect in March 1996. An activation of Title III would undoubtedly unleash a flood of lawsuits, clogging up U.S. courts and discouraging any U.S. or foreign investment in Cuba out of fear of being sued. In fact, the State Department estimates that there could be an avalanche of claims—over 200,000—if Title III were allowed to go into effect. Congressional leaders like Rep. Jim McGovern (D-MA-2) are strenuously pushing back. Now, it’s our turn to stand up! If Trump gets away with this, it will have a disastrous effect on U.S.-Cuba relations for decades. And, more importantly, it would severely hurt Cubans and the Cuban economy. x CALL and EMAIL your members of Congress! 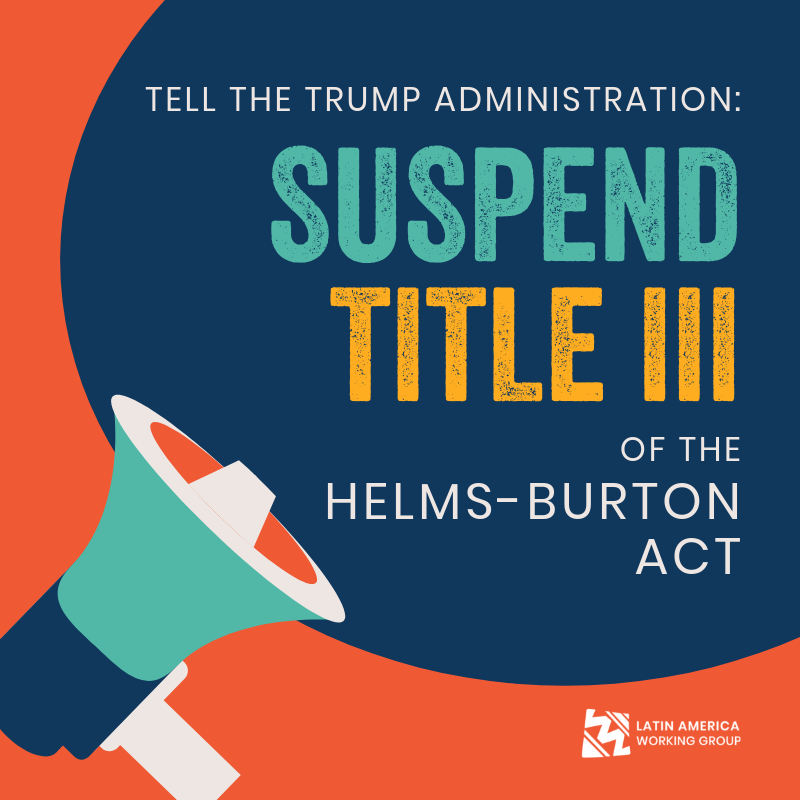 Urge your representative and two senators to contact the White House and the Department of State to demand the continued suspension of Title III of the Helms-Burton Act, and to publicly support the waiving of Title III and denounce the administration’s inclination to allow the provision to go into effect. Go to www.govtrack.us/congress/memebers to find your members of Congress. Click here to send an email to your members of Congress!